(Trent Nelson | The Salt Lake Tribune) Representatives in the House Chamber in Salt Lake City, Thursday March 8, 2018. 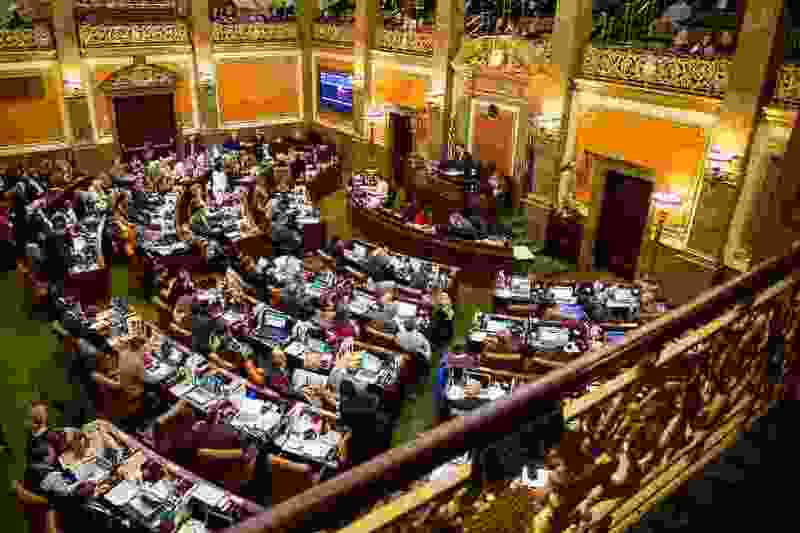 Democrats appeared poised to pick up three seats in the Utah House of Representatives and one seat in the state Senate, according to early, unofficial election results. The minority party was leading in two open House seats — in the Draper and Sandy areas of District 31 and District 10 in Weber County — and seemed in good position to oust one Republican House incumbent, Rep. Bruce Cutler, in District 44 in the Murray area. Democrats Suzanne Harrison, Lawanna Shurtliff and Andrew Stoddard, respectively, were ahead in early results. Harrison lost her bid for the District 31 seat two years ago by just three votes, while Shurtliff is a former legislator who held the District 10 seat for 10 years before retiring in 2008. In the Senate, Democrat Kathleen Riebe was on her way to knocking off Republican Sen. Brian Zehnder, the state’s newest senator, in District 8, in the Holladay and Cottonwood-Heights area. Two other legislative races were too close to call. In the open seat in House District 8 in the Weber and Morgan county area, Democrat Deana Froerer had the edge by less than 1 percentage point. And in House 38 in the Kearns area, incumbent Republican Eric Hutchings was leading Democratic challenger Edgar Harwood by less than two percentage points. Even if Democrats pick up all of these seats where they captured early leads or were within striking distance, they won’t make a dent in the Republicans' supermajority. They would, however be expanding rather than shrinking their minority caucus.